President Donald Trump said Wednesday he'd be "very, very disappointed" with North Korean leader Kim Jong Un if reports that work is underway to rebuild a long-range rocket site are confirmed. Speaking to reporters, Trump said "it's too early to see" if the information about work at the North Korean site is true. Warning he'd be disappointed, he added: "I don't think I will be, but we'll see what happens." "This facility had been dormant since August 2018, indicating the current activity is deliberate and purposeful," said researchers at the Washington-based Center for Strategic and International Studies (CSIS). Kim had agreed to shutter the Sohae missile-testing site at a summit with the South's President Moon Jae-in in Pyongyang, as part of confidence-building measures, and satellite pictures in August had suggested workers were already dismantling an engine test stand at the facility. North Korea was later banned by the UN security council from carrying out the space launches, as some of its technology was similar to that used for intercontinental ballistic missiles, or ICBMs. According to 38 North, the efforts to rebuild structures at the Sohae facility started sometime between February 16 and March 2 this year. The pictures show a moving structure that had been used to carry launch vehicles to a launch pad on rails has been restored, it said. "Two support cranes are observed at the building, the walls have been erected and a new roof added. At the engine test stand, it appears that the engine support structure is being reassembled," the 38 North reported. In a briefing to parliamentarians this week, Seoul's spy agency said it had detected signs of work at the site. Joel Wit, the director of the 38 North project, cautioned that the evidence was not necessarily "consistent with preparations for an ICBM test." "Aside from the fact that (North Korea) has never tested an ICBM from Sohae -- it's a space vehicle launch site -- preparation for any launch would require a wide range of activities not observed in the imagery," Wit said. However, a rocket engine test could be performed there and that would send "a really strong signal" to Washington, Wit said. "A lot depends on how the US reacts to what's going on," Wit said. "The danger here is that we could start spiraling downward as each side takes steps and undermine the process that's been in place since last spring." Impoverished and isolated North Korea conducted its first successful nuclear test in 2006 followed by a string of increasingly successful ICBM launches. In 2017, it claimed it had become capable of fitting a viable nuclear weapon on an ICBM that could reach as far as the United States' eastern seaboard. In response, the UN Security Council later banned the North's main exports -- coal and other mineral resources, fisheries and textile products -- to cut off its access to hard currency. At their groundbreaking first summit in Singapore last year, Kim and Trump produced a vague statement on the "denuclearization of the Korean peninsula." 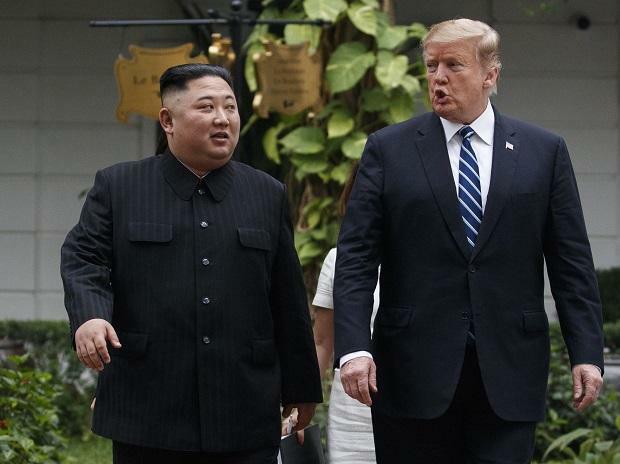 There were high expectations for Kim and Trump's second meeting in Hanoi, but no agreement was reached. Despite the stalemate, both sides said they were open to further talks. John Bolton, the US national security adviser, however said on Tuesday that the US would look at "ramping those sanctions up" if Pyongyang did not give up its nuclear weapons program.